See? Love the ad industry, we're such great travelers! This one was from another friend who just got back from her trip down under. Yay, thanks! 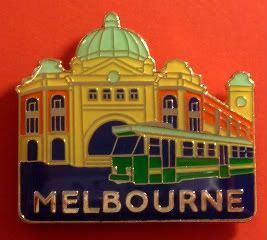 It's pretty famous - the Flinders Street Railway Station, supposedly the busiest in the Southern Hemisphere. The building's been there since the early 1900s, but the trains have been coming and going since 1854. A fairly interesting history, too. I love visiting train stations around the world - they're amazing, quite frankly. From the welcoming great halls and waiting rooms, to the massive trainsheds and grand arches, to the happy hellos and teary good-byes, they're fascinating places. I also love how major train stations seem to all have iconic clocks to meet under. Grand Central here in NY has the gold clock in the main concourse. The historic and savagely gone Penn Station in NY had a giant clock hanging overhead. St. Pancras in London has one. And Flinders is no exception, only they have several! But what cracks me up, though, is whenever I say, hey, I'll meet you at the clock in Grand Central. Seriously? This is what GCT looks like when it's busy. It's insane, and usually consists of a lot of lookin' around, and walking in a circle or two...probably coupled with a txt or a call - generally to ask what the other party's wearing that day. Hahahah. Grand Central was where i saw paul rudd... all those years ago during his i'm-not-working-after-clueless-until-i-become-friends-with-will-ferrell stage. yeah, he looked pretty rough back then. Hahah, I remember that GC sighting! A smile makes you go a mile!